For a long time TIA has wanted to offer our readers a page on Holy Week to allow those who cannot attend the traditional ceremonies to be able to follow them on our website and listen to their touching music. Here and there, there are faithful who live miles away from a traditional Mass and cannot assist at these ceremonies; there is a mother who wants to describe to her children how beautiful those ceremonies were in the past; another case, a man is travelling and cannot bear to go to the Novus Ordo church during Holy Week; or perhaps there is someone who is sick and would like to participate in some way in the steps of the Passion of Our Lord, but cannot leave the house. To assist these readers who cannot attend the Holy Week ceremonies in person, we developed this page. All they have to do is have a pre-1962 Missal open on the corresponding day, and have TIA's page for the same day on the screen in front of them. As the ceremonies develop they may click on the music links to hear the poignant responsorios. When the music ends, they just need to click back and continue following the sequence. Each page contains the beginning words for the prayers of the ceremony, so it is suggested that our readers follow the un-sung sequence in their Missals. The last three days of Holy Week are the most somber of the liturgical year. The name Tenebrae, which is Latin for darkness, has been given to the Matins and Lauds ceremonies of Maundy Thursday, Good Friday, and Holy Saturday as a reflection of the mournful atmosphere that pervades the Church on these days. On Maundy Thursday fifteen candles are set up near the altar, with each candle, as well as the candles on the altar, being extinguished one by one as the ceremony progresses. The Psalms, the chants and the readings all reflect the solemn tone of a Church in mourning, for these are the days to commemorate how our Savior suffered and died. stands for Versicle, the short prayer said by the priest, deacon, or sub-deacon during the ceremonies. stands for Responsorie, which is when the choir or the attending parishioners will be making their response during the ceremonies. Ant. stands for Antiphon, the prayer recited before and after specific parts. Click on the links below to view the pages for the last three days of Holy Week. When you have finished a page, click the back button on your computer to return to this Introductory Page or click the link that takes you to the next ceremony. The Improperia, as well as the responses to the Lessons, known as the Tenebrae Responsories, were composed by Fr. Tomás Luis Victoria (1548 - 1611). Fr. Victoria is considered one of the greatest composers of the counter-Reformation period. 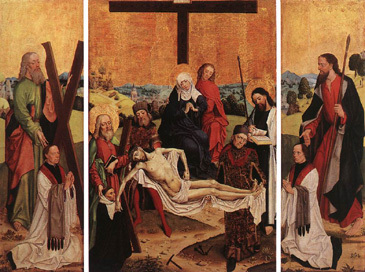 Many of his religious pieces were incorporated into the Catholic ceremonies of Holy Week.